Large-Screen LCDs do more than just convey knowledge and information—they do it with lifelike images that bring people around the world together. No longer just TVs, LCDs today are used in a range of futuristic products, such as interactive whiteboards, digital signage, and multi-panel video walls. 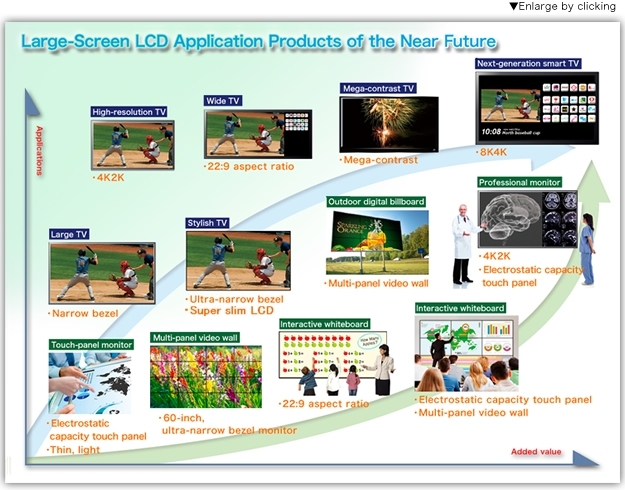 SDP is meeting society’s needs by developing large, state-of-the-art LCDs employing new technologies that realize higher resolution, better image quality, and more advanced functionality. SDP has also started producing 4K2K LCDs. These are being deployed in 4K TVs, which are the center of attention as next-generation TVs that go beyond full high definition (FHD). 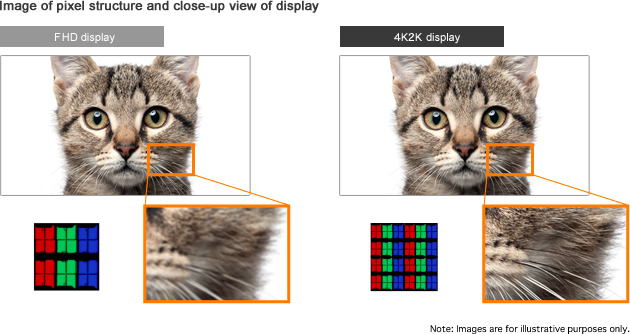 These new displays offer four times the number of pixels compared to FHD images in digital broadcasts, and they give viewers incredible detail that practically puts them inside the picture. SDP is now looking beyond 4K to 8K as it continues to develop high-resolution technologies. SDP’s displays are the first in the world to employ photo-alignment technology*, producing bright, clear images and smooth rendering of movement. The results are both brilliant and expressive. This technology also results in lower power consumption. In addition, we continue to work on developing displays that harness our wide-color-gamut technology to deliver breathtaking images. *Technology for LCD panels in which the liquid crystal molecules inside the display are precisely aligned in accordance with the direction of the radiation. Narrow-bezel technology serves to minimize bezel width, creating a stylish TV design with maximum screen size. This technology is also essential for multi-panel video wall, and we are developing and marketing it for digital signage applications. In the near future, you may even see displays covering an entire wall of your home. SDP is also developing and manufacturing highly functional displays for a range of applications.